Chicagoans in search of a unique BYOB dining experience have found their new destination at Ukai Japanese Restaurant. Executive Chef Paul Chant, is the mastermind of the small tapas plates appearing from Ukai's hot kitchen. With influences from around the globe, Chant has constructed an eclectic array of plates such as an Heirloom tomato Salad with fresh mozzerella, capers, olives and dates with a homemade pesto; deconstructed Mushuu Duck buns with sous vide duck breast, cucumber caviar and cherry-port reduction; and seared Hanger Steak with roasted bell peppers, fried okra and crispy onion rings. Behind the steel and bamboo clad sushi bar, Chef and Co-Owner Choong J. shines with an array of fresh fish, delivered daily to the new northside restaurant. A selection of specialty maki rolls "dedicated to all Chicago sports fans" showcases rolls such as the Cubs Roll with fresh mozzerella, avocado, unagi and shrimp tempura, lightly fired in a tempura batter. We are currently closed. You may place an order now for processing during our regular business hours. Please refer to our hours of operation. I visit here often and their sushi is great every time. They were much busier than usual last Friday. The server mentioned they were short staffed but still managed to bring our food out quickly and was very friendly. Love that it is BYOB too. Good sushi place. Love that’s it’s byob too! Lovely restaurant, nice service, food is excellent. Good price and tasty food. Amazing food, service and ambiance. I strongly suggest their salmon tartar and spicy miso soup! We love Ukai. It’s our favorite sushi in Chicago. Super fresh, interesting flavors, lovely staff. Always a great experience, whether we do a date night or a family dinner with our kids. It was a cold night in Chicago and it was almost just as cold inside Ukai! It was soooo cold we could barely enjoy ourselves. Typically I would have asked if they could make it warmer and I didn’t so that’s on me. However we placed our order, which included miso soup and no one was in the restaurant at the time besides us and after 15 minutes out soup hadn’t come so I had to ask. They must’ve been working on takeout orders but we wanted to warm up! I’ve also never seen frothy miso soup or had had edamame in my miso soup before so that was a surprise. The sushi itself was pretty standard. Great sushi, byob, & reasonably priced. Fairly priced sushi, but you get what you pay for. Always a good experience. Try the octopus salad! The room was too cold. Turn the heat on. One of our neighborhood go-tos. 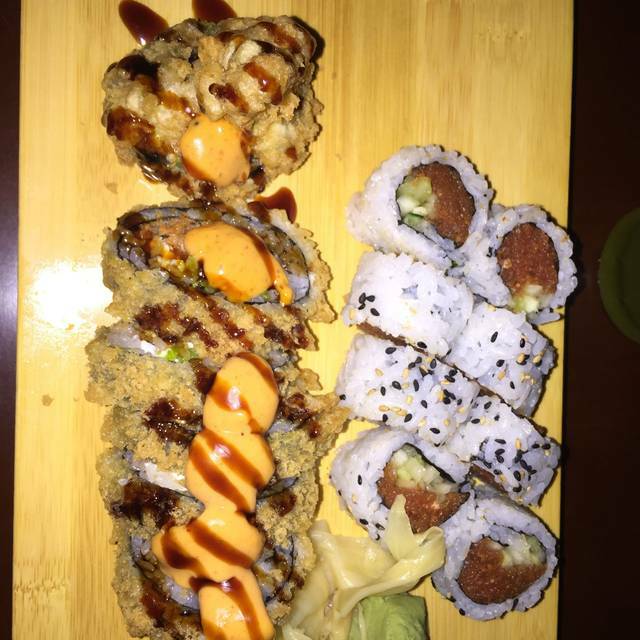 Consistently good sushi. The octopus salad is very good. Try the Dragon Roll. Attentive service. Great food. 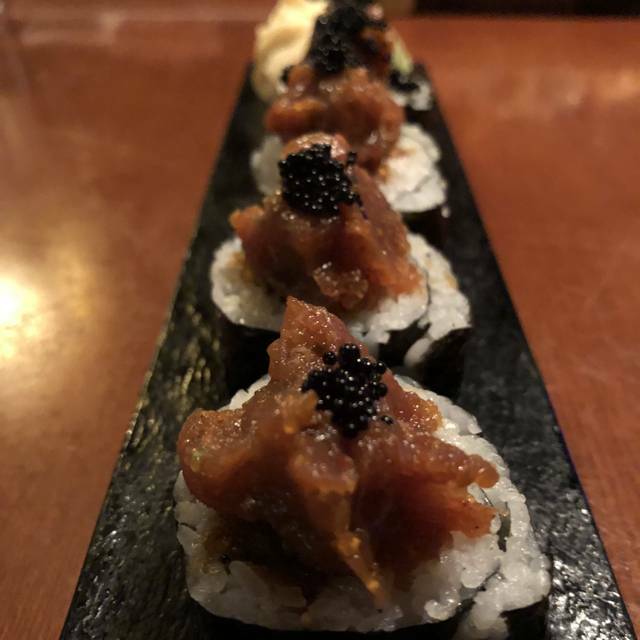 My wife was raving about the crunchy spicy tuna, and the sashimi came in generous portions. It's BYOB, too. good food. try the kiss of fire,volcano and godzilla. Awesome time, they went above and beyond for my friends birthday. The food was delicious and the ambience was perfect for a friends gathering! Very good sushi. Would go to often if I lived there. Becoming one of our neighborhood go-tos. Octopus salad, Fire roll, and Cubs roll were excellent! First visit. Would return. Fire Dragon maki roll was very good. Tuna sashimi was excellent! A tad understaffed on Friday night. BYOB. Great food, great service. Thanks! Will come back very soon! Great location - right by the theater where we were going, so this was a nice option for pre-theater dinner. Upon arrival, we were the first diners but the service was a bit sketchy. Two servers were more focused on folding napkins than coming to check our table to take our order or refill our drinks. They also didn't acknowledge our OpenTable reservation, so I didn't receive the points (that was immediately fixed by a very friendly and helpful customer service at OpenTable). One thing we really liked was their Agedashi Tofu - it was their own unique twist, served in miso soup. It was very flavorful. REALLY good sushi! 10/10 would recommend. The noise level was moderate, but at the one I went it was loud because of a nearby table that had drank too much and were louder than usual. Vegetarian options were really good at this location and miso soup was delish. Really good neighborhood BYOB sushi spot. They're always so nice and food is great. They were super accommodating with adding a table to our group when we had 2 more join us late. maybe i ordered wrong. def. did with one roll but I am not a fan of this place at all. Waitstaff is so nice and the food is always awesome. The tuna poke was the best! The sushi was great and reasonably priced. Service was a bit slow but it was a packed house, so understandable! 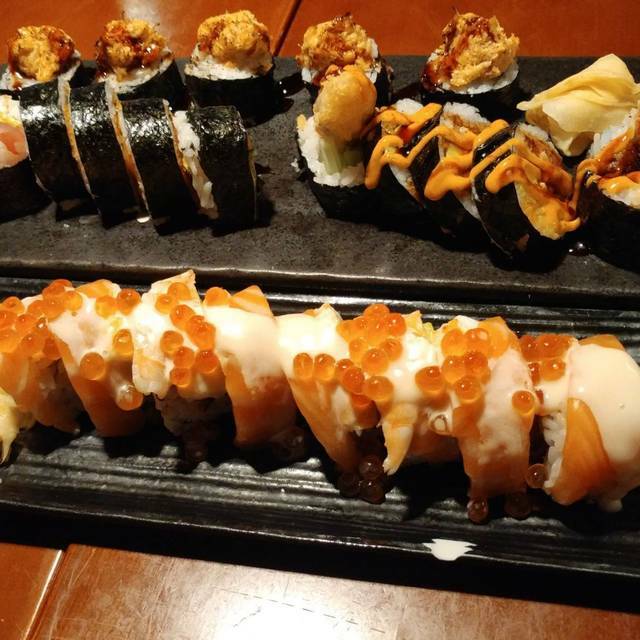 We found Ukai Sushi while looking for a restaurant near to the Theater Building on Belmont. We went for a pre-theatre dinner. The sushi was very fresh. My husband had pork ramen which also was very good. Service was quick and attentive. They have a number of creatively constructed rolls but I didn't sample any of them. I thought the quality of the fish was better than that of a number of small neighborhood sushi restaurants. Love this place! This is my go to sushi restaurant!! Sushi was excellent. Dinner entrees were not as good as most Japanese places. Food was fairly priced, but there was a bit of a language barrier with the server. She had a difficult time answering our questions about the food. Excellent before or after theater restaurant! Many healthy and delicious options!